LAHORE: Former prime minister Nawaz Sharif’s arrival in the city was quite an event for his countless supporters but it affected the routine of many a man in the street on Saturday. Those intending to reach the shrine of Hazrat Data Ganj Bakhsh or other places suffered a lot after police blocked various roads and intersections leading to the PML-N’s gathering. Officials advised them to use alternative routes. “I went out for labour early in the morning but just outside my abode police stopped me. I requested them to allow me to go for work but they would not listen,” complained Murtaza, a construction worker who resides in a street near the shrine. “It’s height of callousness as daily wagers don’t afford a day off,” he said. 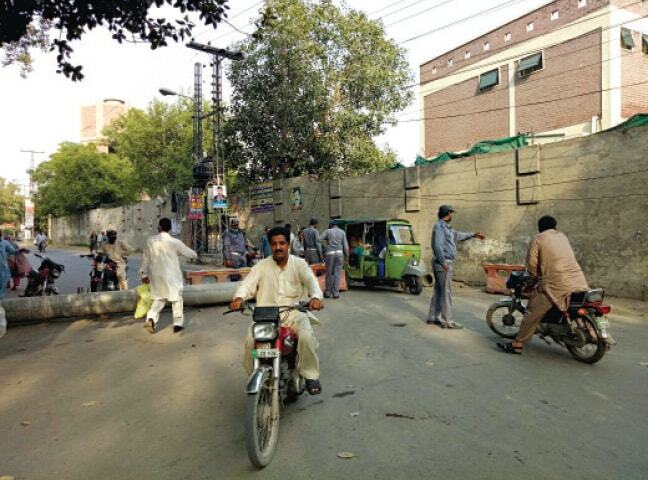 Blockade of roads cut off Data Sahib’s shrine and places such as Ravi Road from the rest of Lahore. Even those residing in several localities near the rally’s venue were forced to stay indoors. Equally affected were the people who had come from other cities to pay homage to the patron saint and visit other places. The shrine was closed around 5pm. “No one is allowed to enter the shrine and we are trying to ensure exit of the devotees already present there as precautionary measure,” said a police official. “It’s strange that my family is not allowed to visit the shrine for which we have specially come from another city,” protested Ishtiaq. “The officials are not permitting us to use the main road and we are using an alternative way on foot to reach the house of our relative,” Hassan, a resident of Sheikhupura, said. A trader, Shabbir, a resident of Bhati Gate, said he faced a great deal of inconvenience in reaching home from his workplace. He said he was a voter of the PML-N but such measures put people off. The Metro bus operation was suspended from Shahdara to MAO College in the evening.